So I made sure that as a must-have meal in Montreal, as I’m spending the Holidays here, among smoked meat and bagels (although no time for poutine), I would eat dumplings, Northern-style. One of Montreal’s prime locations for dumplings is Qing Hua Yuan. They were on St-Marc when they opened last year, but reopened this Fall on Lincoln, close to St-Mathieu in our Chinatown Two, near Concordia University. The boiled dumplings are nothing special, but now the steamed ones! 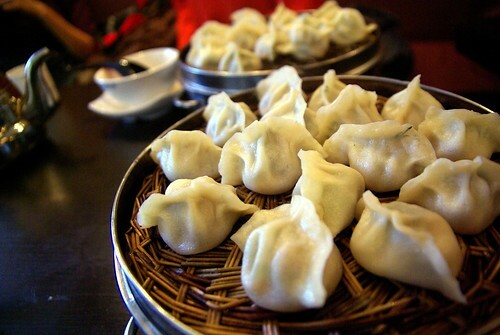 In contrast to their boiled counterparts, they perfectly conserve their full taste, and if you are a connoisseur of food, you would be careful to pierce your dumpling, savour the broth inside, before engulfing the rest of the jiaozi. The flavours seem to have expanded by a bit (any combo of pork, lamb, chicken, eggs, vegetable, anise, coriander, Chinese cabbage, etc. 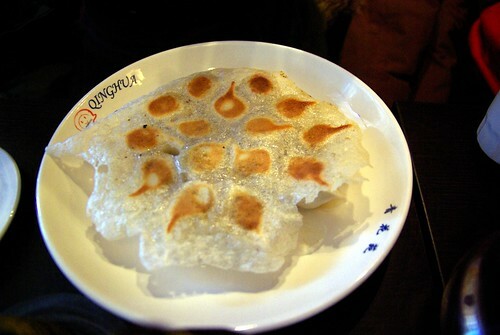 ), on top of the surprising fried dumplings. Extra goodness: the taste of the reed coming from the steamer. The fried ones (see second picture of this post) are served with a fine film, which I am guessing comes from a dried-up flour mixture, which in itself puts up a nice show. Unfortunately, they only staffed one person to take care of the whole floor at lunchtime (it was the Holidays though), and cooled-off dumplings and unusually slow service (one hour from sitting to getting meal at lunchtime) were the resulting minus points. On the other hand, they thought of giving shrimp chips as a free-of-charge snack now, like they would give bread in a European restaurant, because steamed dumplings usually take 25 to prepare. But is not cheap. On my second time there, with my parents at dinnertime, we needed four portions to be full (depending of flavour, steamer/plate is $8-13, + taxes/service). But hey, you’re paying for hand-made top-quality dumplings.